Back again, never mind the Icelandic volcano that nearly grounded us. I came back to a house inhabited only by J for ten days. There was a weird smell, which sometimes happen when you leave a guy alone. It didn´t come from stacked takeout boxes, however (the house was eerily tidy, actually). 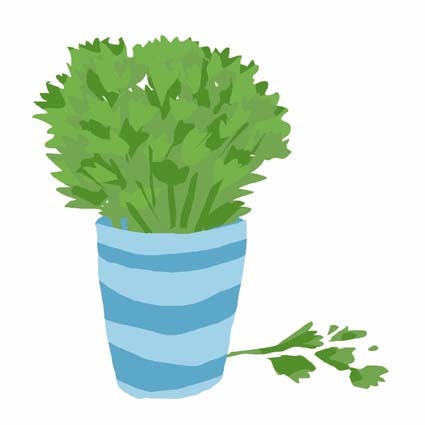 After some sniffing around I located a glass I´d left on the counter with a bunch of fresh cut parsley. Two weeks later, it was a stagnant pond with lots of fuzzy slimy stuff. This was quite lucky, as last time it took me a couple of days to locate the offending substance; chorizo wrapped up and left to molder in a cupboard. I quickly threw that out, but to make sure all lingering nastiness went away, I did the Yolanda-Frying-Fish-Night-Trick. It makes your kitchen smell lovely, and seems to subdue any competing nastiness, so it´s a good one when you´re cooking pungent stuff. Simply, boil some water with a bit of sugar, some lemon, and a stick of cinammon. Let it bubble away on a back burner unattended, but do keep an eye on it. Once it´s boiled down you can even use it to drizzle on fruit salad if you like. Oh and by the way, a recipe for arroz caldoso, by way of Hip Pressure Cooking, where Laura asked me to do a guest post. Thank you! Posted by lobstersquad at 6:50 p. m.
That is great trick! I hate always having to pull out odd smelling candles to cover up an odor! I'm so happy I found your blog! I became obsessed with Spanish food when I went on a trip to Barcelona a couple of years ago. Fortunately, I live in nyc and can find some decent Spanish food. And thanks for the fragrance tip! Sometimes I like to put apples and cloves in boiling water to freshen up the apt and it smells like I've been baking all day.